By accessing the website at http://www.boatlist.org, you are agreeing to be bound by these terms of service, all applicable laws and regulations, and agree that you are responsible for compliance with any applicable local laws. If you do not agree with any of these terms, you are prohibited from using or accessing this site. The materials contained in this website are protected by applicable copyright and trademark law. modify or copy the materials except where it is expressly encouraged to do so: IE posting on our forum pages. transfer the materials to another person or “mirror” or “frame” the materials on any other server. This license shall automatically terminate if you violate any of these restrictions and may be terminated by boatlist.org at any time. To the extent permitted by law, we make no promise as to the completeness, accuracy, availability, timeliness, propriety, security or reliability of the content on boatlist.org. Your access and use of boatlist.org is at your own risk, and boatlist.org is provided as is. We are not liable for any harm resulting from content, user conduct, your use of this content, or our representations. We are not liable for any indirect, incidental, consequential, special, or punitive damages, or any loss of revenue, profit, data, or goodwill. 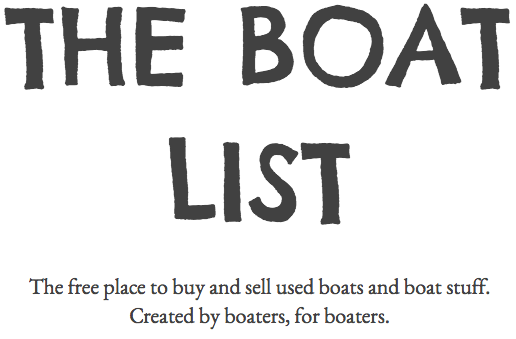 The items posted for sale on boatlist.org are submitted by our users and are provided on an ‘as is’ basis. Boatlist.org makes no warranties, expressed or implied to the functionality, safety, value, or legality of items submitted for posting by users. Further, boatlist.org does not warrant or make any representations concerning the legality, safety. security, accuracy, or reliability of materials on any sites linked to this site. In no event shall boatlist.org, or its affiliates be liable for any damages (including, without limitation, damages for loss of data or profit, or due to business interruption) arising out of the use or inability to use the materials on boatlist.org, even if boatlist.org or an authorized representative has been notified orally or in writing of the possibility of such damage. Because some jurisdictions do not allow limitations on implied warranties, or limitations of liability for consequential or incidental damages, these limitations may not apply to you. The materials and item advertisements appearing on boatlist.org could include technical, typographical, or photographic errors. Boatlist.org does not warrant that any of the materials on its website are accurate, complete or current. Boatlist.org may make changes to the materials contained on its website at any time without notice. However Boatlist.org does not make any commitment to update the materials. Boatlist.org accepts no responsibility for the accuracy or truthfulness of a seller’s item photos, descriptions, or contact information. By contacting and engaging with a potential seller or buyer through or on boatlist.org, you assume all risk associated with your transaction. Boatlist.org has not reviewed all of the sites linked to its website and is not responsible for the contents of any such linked site. The inclusion of any link does not imply endorsement by boatlist.org of the site. Use of any such linked website is at the user’s own risk. Boatlist.org may revise these terms of service for its website at any time without notice. By using this website you are agreeing to be bound by the then current version of these terms of service. Boatlist.org is designed only to put potential buyers and sellers in contact. We are not an online store. We provide the buyer with the means to contact the seller and when requested we provide a PayPal link to the seller’s PayPal account. Boatlist.org accepts no responsibility for transactions. We accept no responsibility for undelivered funds, fraudulent buyers or sellers, or scams. You buy and sell your items at your own risk. By listing an item on boatlist.org you agree to ship your item within two days of receiving payment and you agree to provide the buyer with a shipment tracking number. 10. We reserve the right to remove any ad at any time.